The Piper PA-19 Super Cub is a two-seat high-wing light utility aircraft. The type designation PA-19 was originally used for three prototypes of the military Piper L-21. On 1 April 1949, the FAA issued a Type certificate for the type PA-19, which was then the civilized version of the military L-18C. The Piper PA-18 Super Cub flew for the first time in 1949, and the FAA Type certification was awarded on 18 November 1949. The first production Super Cubs were delivered in 1949. Over 10.000 Super Cubs were built, including about 8,500 civilian Super Cubs and more than 1,800 delivered to the U.S. and several foreign military services as L-18Cs and L-21s for liaison; training; transport and target tugs work. Most of the Super Cubs were built until 1981 when production originally ceased. Super Cub production resumed by WTA between 1982 and 1988 totalled 250. Between 1988 and 1994 Piper Aircraft built another 102. 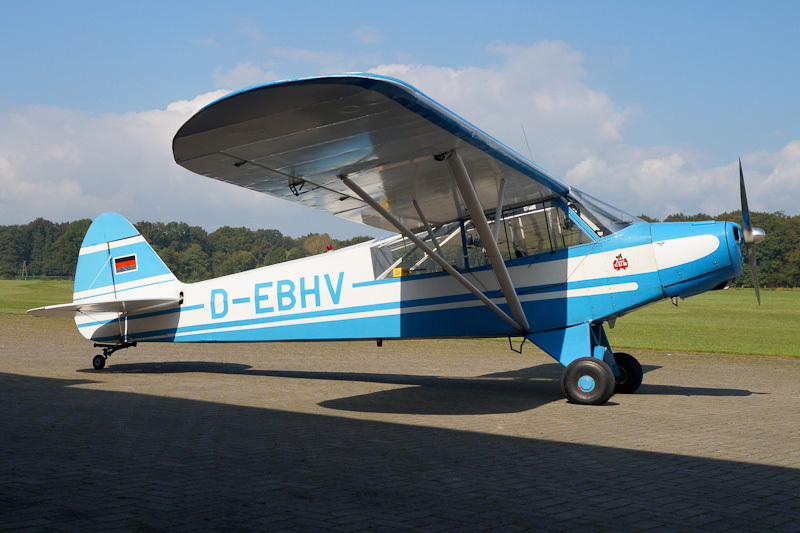 On 27 September 2014, the 1952-built Piper PA-18-95 Super Cub D-EBHV was seen at Flugplatz Borken-Hoxfeld in Germeny. The Piper L-18C c/n 18-2058 was built under USAF number 52-2458 and entered service with the Koninklijke Luchtmacht (RNethAF) 298 Squadron as replacement of the Auster in January 1953. The aircraft was operated first as "R-73", but was re-serialed "8A-70", and in 1959, re-serialed "R-73"again. The Royal Netherlands Air Force received 155 Piper L-18C, L-21A and L-21B Super Cubs. The aircraft were owned by the Army but flown and technical supported by Groep Lichte Vliegtuigen, formed by 298, 299 and 300 squadron of the Koninklijke Luchtmacht (RNethAF). After retirement from the military duties several of the Dutch military Super Cubs were transferred to the KNVvL. On 26 July 1966, L-18C Super Cub "R-73" was registered PH-JKB as Piper PA-19 c/n 18-2058 with the NLS - NV Nationale Luchtvaartschool, Den Haag. Piper PA-18 PH-JKB is registered with c/n 18-2058, but it is known that frame 18-2074 is used by this Super Cub. On 12 January 1968, Piper PA-19 PH-JKB was registered with Eerste Utrechtse Handelsonderneming N.V., Rhenen. On 30 September 1969, W.K.F. van't Hof, Wageningen, was registered as owner of the PH-JKB. On 30 October 1973, Piper PA-19 PH-JKB was registered with Vliegclub Hoogeveen, Hoogeveen. On 13 August 1974, the Super Cub was registered with B.H. Verbeek, Enschede. On 17 September 1974, registration PH-JKB was cancelled as exported to Germany and in March 1975, the aircraft was registered D-EBHV. In 2002, the aircraft was completly overhauled by the Motorfluggruppe Borken/Westfalen. Today, Piper PA-18-95 D-EBHV is operated as a tow plane by LSV Borken from Fluggelände Borken-Hoxfeld.